The Cropsey Avenue Bridge was built in 1931 as two separate structures sharing common abutments over Coney Island Creek. Both structures are movable (double-leaf bascule) bridges rotating and opening over the abutments around a trunnion. These structures carry six lanes of traffic, three lanes in each direction. 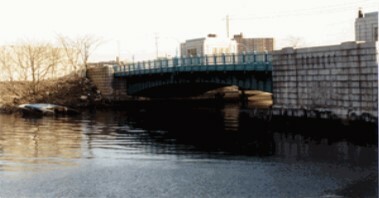 This bridge, together with another bridge (stillwell Avenue), provides the only access between the communities of Bensonhurst and Coney Island. The Cropsey Avenue Bridge carries a heavy concentration of traffic, both vehicular and pedestrian, especially during the summer months due to its close proximity to the Coney Island beach resort area. B & H Engineering, P.C. has provided construction support services to the New York City Department of Transportation for the Rehabilitation of Cropsey Avenue Bridge. The services involved review of shop, erection, electrical and mechanical drawings including catalogue cuts, approach deck and slab reinforcement, contractor's proposed loading, calculations and procedures for balancing the bridge, temporary structures, survey data, field changes and modifications, concrete haunch tables; the investigation, analysis and preparation of responses to unanticipated field conditions; the clarification and furnishing of design intent of plan, specifications, and estimate. This project consisted of replacement of roadway stringers, top and bottom lateral bracing, deck; epoxy overlay, and timber fender system; installation of an I-Beam-Lok deck, safety barriers, sign structures, drainage and lighting system; modification of the operator' house; removal of hazardous waste; air and noise monitoring; work zone traffic control on the bridge and local streets.